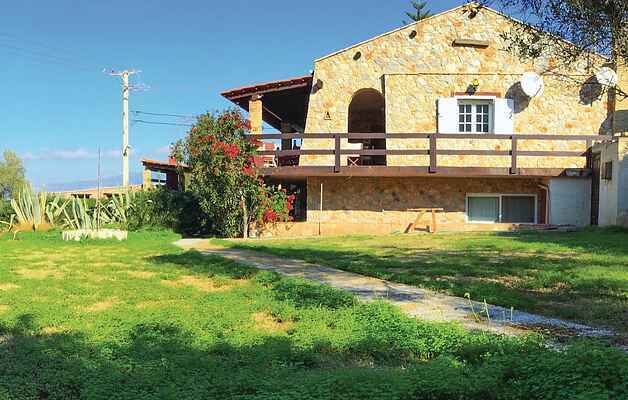 Exceptional detached waterfront stone house located in Alepochori seaside village.This two levels private villa is the perfect choice for amazing holidays. The two floors connect only through exterior stairs giving you the opportunity to have privacy if you are a big family or a group of friends. The ground floor has 2 bedrooms, a large living room and a fully equipped kitchen.The upper floor has two bedrooms also a living-dining room, a kitchen and access to a large terrace overlooking the sea. The fenced garden of the house is literally a dream paradise with grass colorful flowers and trees that will give you shade on hot summer days .At the edge of the garden right in front of the sea there is a traditional gazebo to enjoy your breakfast or an afternoon refreshing juice.There is also a covered terrace from where you can enjoy the sun and the breathtaking sea view. The beach is right in front of the house. You just open the front door, cross the street and the famous beach of Alepochori invites you for endless fun.In 5 km you can find the famous sandy beach of Psatha with crystal clear waters, water sports and many restaurants by the sea to enjoy delicious Greek cuisine and fresh fish.